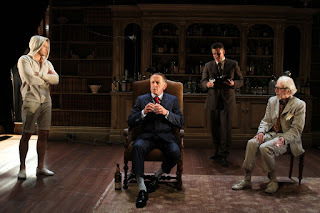 Sydney Theatre Company, Queensland Theatre Company and Bank of America Merrill Lynch present NO MAN'S LAND by Harold Pinter at the Drama Theatre, Sydney Opera House. NO MAN'S LAND by Harold Pinter written in 1974, especially for John Gielgud and Ralph Richardson, at the National Theatre of Great Britain, under the direction of Peter Hall (it later transferred to the West End and Broadway), is, surprisingly, having it's first professional production in Australia. It is directed by Michael Gow and has Peter Carroll and John Gaden creating these two demanding and tantalising, inexplicable characters: Spooner and Hirst. In a room with a vast wall of books (Set Design, Robert Kemp), books that hold the record of human memory and aspiration, that surround a large and well stocked bar of alcohol - a kind of altar equipped with the fermented potions that distort and/or obliterate memory and, perhaps, prevaricates aspirations; sparsely furnished and warmly, atmospherically lit (Lighting Design, Nick Schlieper), with a huge heavily curtained window - not much natural light allowed here - and secret door, we meet two old men. Hirst (John Gaden), slightly aristocratic and imperial, but, we discover, pleasantly, unpleasantly 'pickled' , seated, enthroned, in a comfortable armchair, attending to a loquacious and decidedly raffishly dressed visitor, Spooner (Peter Carroll). Spooner, stands. He is not invited to sit, although he is encouraged to drink and to serve drinks to the other. After a chance meeting on Hamstead Heath, a parkland, next door to this house, known since the 18th century as a gay cruising area, the two gentlemen have a long duet of conversation. We observe. We mostly listen. Both men are feeling out the other's identity and attempting to refresh their memories of a possible shared past. The past veiled in the fumes of vaporous, vague memory. "Have another drink". The conversation is mysterious and circumlocutory. It is sophisticated, witty, full of sophistry. It is dazzling. It is beguiling, teasing. It is besotted, however, not with clear meaning, but, with clues, of a kind. Clues, to what? There is a secret. (Pause). Isn't there? Hirst has two servants. Briggs (Andrew Buchanan) and Foster (Steven Rooke). Both working class 'toughs'. Both, incongruous to the reality of this world, this situation. Both of them earthed in a way, in this cultural memory box, this library, that exudes a kind of patina of menace into the world of these two old aesthetes, these two writers. As time and conversation passes, more than an exudation of a patina, rather an opaque atmosphere of highly charged danger envelopes the room. One is a flamboyant 'queen' in elegant, fashionable white suited attire, the other an ambiguous representative of what one could describe as 'rough trade', dressed well, but sexily understated, casual. Sexual innuendo hangs heavy. This quartet of lubricated and ambiguously libidinous 'talkers' spin a tangled web of possibilities, indeed. Indeed. What is the secret that is going on, here? Just what is this play about? That question becomes the essential pleasure or frustration for any audience watching it. Having read it before seeing it, this is the enigmatic quest that keeps one engaged.I was deeply curious, full fathom deep curious, for, even with the leisure of time, with the book in my lap, I was baffled, puzzled. But excited. The text ,for the alert, is a kind of thriller to decipher, and depending on the sophistication of one's own cultural referencing, one can, as a reader spin multiple solutions. But, what Mr Pinter has constructed is a beautiful, contradictory, tangled web of possibilities that seated in a library with some drinks might encourage stimulating conversation, much like that of this babble of Hirst, Spooner, Briggs and Foster (N.B. Mr Pinter was a cricket enthusiast and these characters all carry the names of four of the greats of county cricket. Is that a clue or one of Alfred Hitchcock's famous McGuffins?). There is perhaps no real answer. Just a never ending puzzle of delighted intellectual pursuit, for those of us who do not need guaranteed answers. Like an Escher drawing, the play's explanation may just go round and round or for the tormented, appear nothing more, than abstracted expressionism. Pinter, like Shakespeare, being also an actor (unlike Shakespeare, a Director, as well), knew the powerful influence that any actor has when he speaks and moves the writer's text - as he inhabits it. The words on the page when interrogated by other minds become even more complex in possibility, even in the most mundanely proficient play writing, when challenged and then embodied by actors. And, Pinter, in the case of NO MAN'S LAND, knew he had two of the world's great actors, who had demonstrated over decades of practice, a protean ability to create with quicksilver deftness, language pleasures and ambiguities, with clever minds and magical voices. The writing, then as read on the page, produces characters of polyhistoric learning, but actors especially two geniuses of the theatre such as John Gielgud and Ralph Richardson had also in their possession, expressive physical tools of unmatchable ability. Why not set them a problem. Let us play, together. Peter Hall, the original director of this play, tells us that, these actors were both Shakespearean. "They believed in text... and their real strength was their verbal dexterity, their telling quality, in the sense of what they told an audience. They had fine voices and they had wit." Humour. The ability to take a word and fully interrogate it, "mint it and make it happen" with layers of possible meaning. Their honed polyphonic gifts endowing possible nuance in every sound that made the words. Both actors, says Mr Hall, but especially Gielgud, could cast a spell on his audience with his mind and tongue and have them chase him "saying: no no no no, please wait for us, please give us more; and he is gone." That both actors were well known and loved by their audience was an asset - one famously heterosexual and the other infamously, at one time notoriously, homosexual, so the ambiguous sexual innuendo, the tensions in this text, became even more exquisite for the audience, of the time, to gambol in. Clearly it worked, for the original production gave some 378 performances. Here at the Sydney Opera House, Peter Carroll, especially, demonstrated a vocal and verbal virtuosity of great skill. John Gaden, too, but with not as much 'trained' vocal pyrotechnics, layered his verbal demands with transcendent wit. The second act duet, between Hirst and Spooner was, particularly, dazzling in the hands of these two actors. Certainly, these two veterans of the theatre stage, and familiar sparring partners, had great obvious 'fun' in playing (improvising) with each other. But, and there is nearly always a BUT for me, as those of you who read me regularly know (it is hard to have perfect ART, no matter how hard we endeavour, and that is part of the fascination of any artistic craft pursuit, surely. Surely? ), no matter the dazzle of the technical homogeneity of these two artists, I felt that they were showing us this - that this was the objective of the sparring-game: a demonstration of craft, and little to no revelation of character. The achievement of vocal technique and the vicarious demonstration of it was the be-all, the end-game of this performance work, not the progress of the rivalry, struggle, between Hirst and Spooner. Virtuosity for virtuosic sake. An inadvertent masking of what the characters were doing? There was, for my money, a lack of ambiguous sexual motivation to these men, neither of these actors sufficiently daring in self-revelation about the possible complexities of the writer's characters. The great Mr Carroll and Gaden SHOWED me stuff but did not REVEAL much beyond highly sophisticated actorly mechanisms of craft. Did they, were they baulking from the famed tensions of Harold Pinter's writing content and style? Of the sexual and violent tensions that existed between the original two actors that was part of the astounding success of the first production? The deliberate physical 'clowning', unrealistic stylisation of the drunkedness of Hirst and the finding of his chair, and the simply astonishing athletic demonstrations of physical agility by a remarkably fit Mr Carroll as Spooner, seemed to indulge a propensity of the actors rather than elucidate anything meaningful to the drama of the characters or their interactions with each other. It was most distracting and derailing for the interpreting audience. Confusing. What world are we in? Who are these men as represented by these relatively grotesque physical offers in the storytelling. A lapse of judgement to allow this, by Mr Gow? Richard Eyre interviewing Peter Hall in preparation of the television series CHANGING STAGES for the BBC suggests that Harold Pinter is a singular voice, "as with all great writers". Mr Hall, a long familiar, nay, historic champion of Mr Pinter's work, says, "Harold Pinter's voice is rooted in cockney and in Jewish cockney. And that's what it is. And even when he moves out of it, it's still there as a point of reference in some strange and peculiar sense. The basis of Harold's drama ... is piss-taking, the cockney phrase. "Piss-taking" is me mocking you. The essential thing about piss-taking is that, as I mock you, you should not be sure that I am mocking you, because if you can see I'm mocking you then I have lost. The whole of Harold's drama is based on that in one form or another". It is the classic English comic technique of using language as weaponry in the tradition of the 'Dandy's', stiff upper lip wounding with words, vitally indulged from the time of the Restoration repertoire, reaching a kind of apotheosis with Oscar Wilde's THE IMPORTANCE OF BEING EARNEST, inherited further, later, by Joe Orton and, of course, Tom Stoppard and Pinter. There is no doubt that the Australian actor has a firm grip on the piss-take (maybe a hang over from our convict heritage and our cultural problem with authority figures?). The piss-take is, generally speaking, the dominant choice for the Australian actor, when confronted with big emotional exposures (the new Belvoir production of AS YOU LIKE IT is a cultural exemplar of that habit - go for the piss-take in replacement of the emotional risk-take. Self revelation for the sake of emotional truth and confrontationally dealing with the vulnerabilities of that, for the pinnacle of craft and art in performing, is not always easily embraced in our cultural armoury. It does save, truth speak and revelations, and possible awkward embarrassments.). Both, Mr Carroll and Mr Gaden are prepared for the piss-take, and brilliantly so, but not, perhaps, for the risk-take required to make Hirst and Spooner indelible icons of theatre life reflecting real life. Mr Hall goes on: "And the piss-take actually hides violent emotions. Underneath every Pinter play there is a very strong melodrama, very basic and full of hate and hostility." He goes on to say: "When I'm directing Pinter I often rehearse with all the inner feelings made overt and the actors all scream at each other. Then they know what they're bottling, what they're hiding, what they're containing". This element of the elemental violent struggle for supremacy over each other, motivated by hate and hostility, is what I felt was, relatively, absent from the performances in this production. A kind of condescending cultural caricaturing of our English forebears. An aside: I remember as a member of the Sydney Theatre Company production of THE LIFE AND TIMES OF NICHOLAS NICKLEBY, of us, the company, approaching the characterisations in the play based more certainly about the images of the David Lean films of Dickens, friendly caricaturesof the English. Much time, after our highly esteemed performances had finished, I remember seeing the televised capture of the original Royal Shakespeare Company production. The striking difference was that the English company were playing affectionately, their great, great grandparents, relatives of their near blood heritage, whereas we were more often than not tempted to 'piss-take' the characters as cartoonish, and score laughs rather than deeply felt truths that were redolent with pathos - pathetic rather than comic, if the truth be told. This is what I sensed in the playing by Mr Carroll and Gaden as well. An unconscious, but culturally embedded disrespect for the characters as real life representations of a culture, rather, comic distillations of a kind of Englishman, that we Aussies find amusingly daft. Mr Buchanan as Briggs, one of the east-ender toughs, seemed to be more interested in pulling off the stylistic brilliance of Mr Pinter's text within, what I felt was an over gratuitous exhibition of a certain kind of homosexual stylistic behaviour, then engaging convincingly in the violent predatory action for power and status. Piss-take over risk-take. That Mr Rooke,as the other tough, Foster, so effortlessly, from his look, body language, through to his textual and vocal skills, revealed all the typical Pinteresque menace and motivation that is requisite for the convincing playing of these plays, threw clearer light onto what the other actors were not doing, for me. I am a late comer in my admiration of Harold Pinter's work. It was my own fear of the characters and their oh, so explicable motivation and actions, that I recognised in the working class roots of my own background that caused me to close myself off and shun appreciation. It was too alpha-masculine and confrontingly violent in its undertow, for me to deal with. Pinter's early plays THE BIRTHDAY PARTY(1957), THE CARETAKER (1959), THE HOMECOMING (1964) reverberated with the tensions of my own experienced environment, dinky-di Australian as it was (I, of course, was not aware of the plays until a decade or so after their writing, but in my Australian upbringing still terrifyingly relevant). Too much even, at that time, for me to bear in the theatre which was my refuge, my principal place to escape from my real life. Later, however, with more education and life jostling, I began to be intrigued by the work, then attractively engaged by OLD TIMES (1970) and BETRAYAL (1978): the tragic depth of the heartbreak of the living in intimate personal interaction, more essentially, middle class, was some how more romantically easy for me to participate in - though far from my own life journey. Besides, there was a sophistication of obtuse structure that drew me - a pleasure in the inexplicable, the mysterious deliberate obfuscation of the writing puzzles, style. Truth in drama is forever elusive. You never quite find it but the search for it is compulsive. The search is clearly what drives the endeavour. More often than not you stumble upon the truth in the dark, colliding with it or just glimpsing an image or a shape which seems to correspond to the truth, often without realising that you have done so. But the real truth is that there never is any such thing as one truth to be found in dramatic art. There are many. These truths challenge each other, recoil from each other, reflect each other, ignore each other, are blind to each other. Sometimes you feel you have the truth of a moment in your hand, then it slips through your fingers and is lost. I have often been asked how my plays come about. I cannot say. Nor can I ever sum up my plays, except to say that this is what happened. This is what they said. This what they did. That NO MAN'S LAND ( 1974) sits centrally, in creative and literal time, between OLD TIMES and BETRAYAL is arresting. Pinter in an unhappy marriage with Vivien Merchant, began an affair with Antonia Fraser, later his new wife, may account for the thematics of OLD TIMES and BETRAYAL, but the writing of this obtuse work, NO MAN'S LAND, sitting between those two great plays, comes from what psychic need? It was after the opening night of NO MAN'S LAND that Pinter finally terminated his marriage to Ms Merchant. This play, then, was written in turbulent personal times for the writer, in a no man's land of unlove and love for two women. A kind of hell that only death may solve? Certainly a time for depression. This urging psychic need by the writer to express himself, is, for the thinker, possibly, an entrancing, entangling pre-occupation. My pre-occupation has led me to these thoughts of attempting comprehension: No man's land is that space on the battlefield between the two enemy trenches or positions in warring times. It was often that place where the wounded were left to cry out for aid but dwindled to death. It was a place, that in the memory of the survivors, was a causation for great depression. Depression registered and survived with dulling memory with excessive drug-taking, drinking, of one kind or an another (Vivien merchant died later of alcoholism). Is this library, this room of memory and alcoholic 'bliss', Hirst's 'no man's land' where he drinks himself into kinds of oblivion and ultimately to death? Is Spooner an angel of death or as he says early in act one "the ferryman" to take Hirst to the next stage of mysterious existence - non-existence - to that "undiscovered country"? (it interests me - that four years later, as almost simultaneously Edward Albee was writing his great surreal death play, THE LADY FROM DUBUQUE (1977-78) that has an angel of death called Elizabeth and a companion, guard arriving, in an otherwise naturalistic convention, to take Jo, Albee's dying heroine, to the after life). Are Briggs and Foster, protectors, guardians hired to fend off this inevitable visitor, guest? Could the temporal expanse of the actual entire play, be providing us with a represention of the surreal last seconds of consciousness, of Hirst's life flashing past him in this pickled, bias state? Is this the secret of this play? Is this the truth of it? Did you have a suggestion? The parallel author in my mind, to the work and style, in the same time frame, of Harold Pinter, as indicated above, is Edward Albee. Both these writers are literate, wordsmiths and great composers of the musical texts. Both these writers, were mistakenly categorised, by me, in my youth and general Australian ignorance, as naturalistic writers. But now I see them as fearless experimenters in surreal or expressionistic abstracted style. Remembering the bewildering experience of WHO'S AFRAID OF VIRGINIA WOLF/ (1961-62) in John Clark's famous Old Tote production, 1964-65, (what's happening? ), being flummoxed by the 'weirdness' of TINY ALICE (1964), (I still am), or in awe to works like BOX and QUOTATIONS from CHAIRMAN MAO TSE-TUNG (1968) and SEASCAPE - 1974 , the exact same year as the writing of NO MAN'S LAND - where a middle-aged couple encounter on the beach shore two talking lizards, and one is forced to reflect and acknowledge the subtleties and daring of these men. Undoubtedly, influenced by Samuel Beckett (the character of Hamm, the hero of Beckett's ENDGAME is a sort of tyrant (Hirst) who's dominated by his domestic staff) and Eugene Ionesco, among others, these writers were what we might say 'out there' in form and content. 'In your face', sharp, elliptical, conceding nothing to anything other than itself... 'This is it, sort it out for yourself'. Considering the history of most Australian play writing, then and now, we would still say 'Out There' or 'In your face'. Patrick White, Dorothy Hewett are the best known writers of experimental form in the Australian scene that I can significantly recognise. And they were hardly praised for their visions. That this is the first professional production of NO MAN'S LAND is also sad reason to give me pause about our cultural maturity (as Australian's). Michael Gow's production is a very welcome adventure. That not all the elements are secure is the way of the world of creative effort. I am better off, for having seen it, than not to have, I reckon. Thanks. It has been an immense feast for thought. It has elicited a deeper appreciation of one of the great writers of the 20th century. I enjoyed immensely the hearing of the text. The language of the writer a refreshing bath of challenge. The 'musical scoring' of the writer, mostly achieved, here, was wondrous. The unavailable intent, and meaning, of the play a great joy. Not frustration at all. Provocative, and, possibly, of infinite dimensions. I would look forward to another artistic enterprise using this text. And, knowing the direction of Mr Pinter in the late life of his writing output, and acknowledging it as formidable, should I regard NO MAN'S LAND as the greatest of Pinter's achievements? Certainly, although immensely esoteric, compared to the learnt understanding of OLD TIMES and BETRAYAL, I believe it is the one I would like to see again before I die. Awful to know that this is this play's first outing on the professional stage, at least here in Sydney. P.S. I think the decision of playing Pinter's Two Act play as One Act, without an interval, does the music and, possibly, the comprehension of this work some harm. A respite, discussion over coffee or drink in my experience, in the interval,often prepares the audience for the second half advantageously. Antonia Fraser in her memoir of her time with Pinter: MUST YOU GO? - MY LIFE WITH HAROLD PINTER (2010) remarks "Nothing causes Harold more pain than unlawful interference with his text". TALKING THEATRE - Interviews with Theatre People - Richard Eyre. 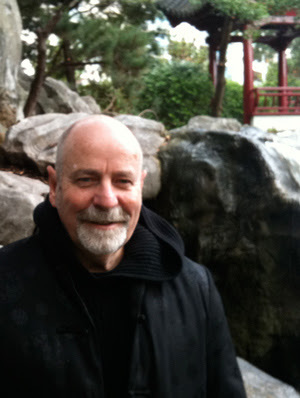 Nick Hern Books, 2009. POWER PLAY - The Life and Times of PETER HALL - Stephen Fay. Hodder and Stoughton,1995. EDWARD ALBEE - A Singular Journey. A Biography - Mel Gussow. Simon and Schuster, 1999. CHANGING STAGES -A View of British and American Theatre in the Twentieth Century - Richard Eyre and Nicholas Wright. Alfred A. Knopf, New York -2001. The program notes from the Sydney Theatre program.